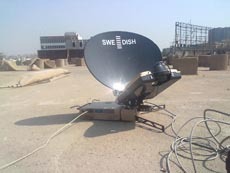 SWE-DISH satellite suitcase terminal for sale in Pakistan. 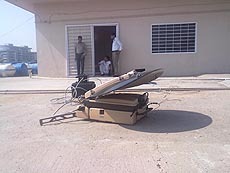 Eastern TV News - based in Pakistan - is selling an almost-new SWE-DISH suitcase satellite terminal. Ali Kaifee, ETN's Director of Operations, told TVZ that it's a CC90 (2010 model) which has only been used for five hours. He said the reason for the sale "...is that mostly all our Western customers require uplink from very high power-consuming satellites. We'd rather invest in an auto-point driveaway larger in size."